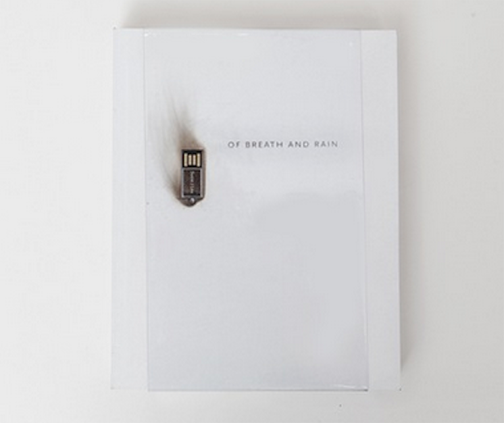 Published by the Frye Art Museum on the occasion of the exhibition Susie J. Lee: Of Breath and Rain, this multimedia artist book aptly showcases the time-based nature of Susie J. Lee’s artwork. The book includes an introduction by exhibition curator Robin Held, a scholarly essay by art historian Kolya Rice, a literary work by Rebecca Brown, and a foreword by Director, Jo-Anne Birnie Danzker. Paired with the book, content on a flash drive—an audio experience, an artist interview with Robin Held, and the Still Lives portrait from the Frye’s exhibition—provides the reader a unique interactive experience. practice that captures a /the dichotomy of the material and the ephemeral. Containing four different weights of paper, four different types of velum, a mini custom USB, debates, deliberations, mock-ups, and test drives. A pure collaboration–a process involving transactions between people, objects, technologies–unfolding formally and conceptually into late night manifestations and revelations. The primary paper stock is Mohawk. This book was typeset I Scala Sans and laid out using Adobe InDesign and AppleScript. Text was processed using Vim and Sed.